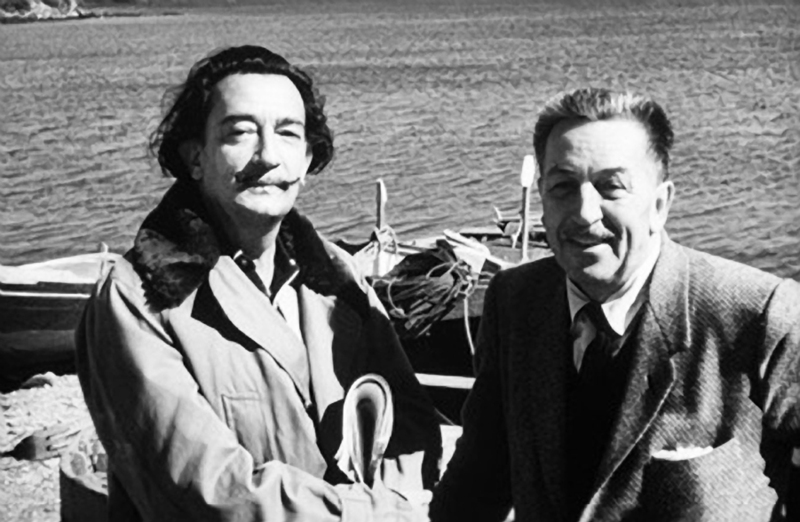 Salvador Dali and Walt Disney apparently met at a WB studio party while Dali was working on a sequence for the Alfred Hitchcock film Spellbound. Disney was eager to involve recognized artists with his own studio, and in 1946 they began work together on a short animation called Destino. Dali completed 22 paintings and some 135 story sketches for the project, but unfortunately only 18 seconds of test footage were shot before it was abandoned due to declining public interest in “package pictures,” the groups of short films popular in previous years. In 1999 Roy Edward Disney committed to finish Destino, handing the original storyboards along with notes from the journals of Dali’s widow over to 25 artists (including John Hench, who had worked on the original project). The 6 minute short was finally screened in 2003 and includes a mix of hand-drawn and computer animation, along with the 18 seconds of original footage (shown at 3:31) and the original score composed by Armando Dominguez and sung by Dora Luz. Destino will supposedly be released in blu-ray as a special feature on the Fantasia & Fantasia 2000 Special Edition on November 30, 2010, possibly with a different score. Un Chien Andalou (“An Andalusian Dog“) is a sixteen minute surrealist film released in 1929 by Dali and the Spanish director Luis Buñuel. The idea for the film actually began when Buñuel told Dalí about a dream in which a cloud sliced the moon in half “like a razor blade slicing through an eye”: Dalí responded that he’d dreamed about a hand crawling with ants. The two developed a shared fascination of the imagery that could be developed from the human psyche and decided to write a script based on the concept of suppressed emotions. According to legend, on screening the film for the group of noted European artists calling themselves “surrealists” Dali and Buñuel carried rocks in their pockets for self defense against an anticipated negative response. 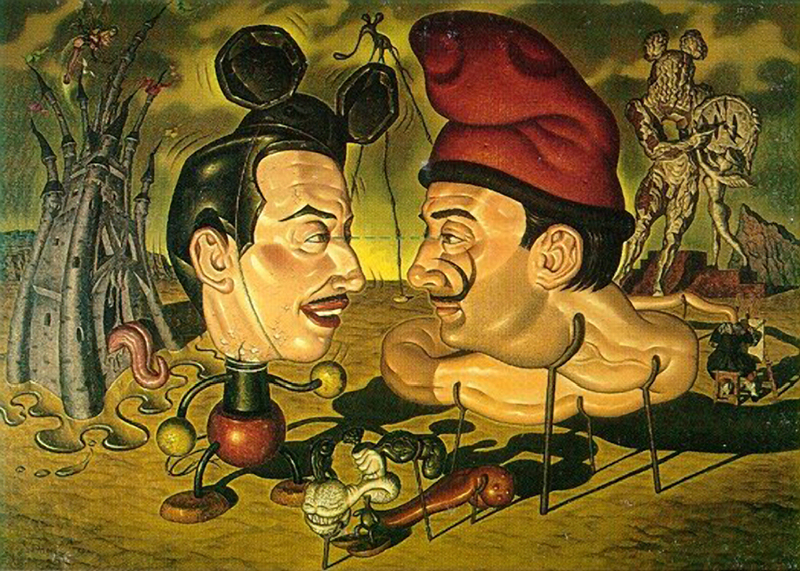 They were disappointed when the audience enjoyed the film -making the evening “less exciting” according to Dalí- however it heralded the acceptance of both Buñuel and Dali into the surrealist movement. Both acting leads eventually committed suicide: Pierre Batchef overdosing on barbitol in a Paris hotel room in 1932 and the actress Simone Mareuil by self-immolation in the public square of Périgueux France in October 1954. L’Âge d’Or (“The Golden Age“), written by Buñuel and Dalí and directed by Buñuel, is a full length 63 minute piece released in 1930. Shortly after the screening a group of “incensed members” of the fascist League of Patriots threw ink at the screen, assaulted members of the audience and destroyed art works by Dalí, Joan Miró, Man Ray, Yves Tanguy and others on display in the lobby. The Prefect of Police of Paris, Jean Chiappe, arranged to have the film banned and a contemporary Spanish newspaper condemned the film as “…the most repulsive corruption of our age… the new poison which Judaism, masonry, and rabid, revolutionary sectarianism want to use in order to corrupt the people.” It was pulled from distribution for almost 50 years: the official United States premiere was not until November 1979 at the Roxie Cinema in San Francisco.